Greenhouse gas emissions in California must be at a level of 250 million metric tons of carbon dioxide equivalent (MMTCO2e) units. That’s the target for year 20301 as prescribed by Executive Order B-30-15 and California Senate Bill 322 and which amounts to a 181 MMTCO2e-reduction below the 431 MMTCO2e-figure, the goal established for 2020 or a reduction of 40 percent. So, I am curious to know how many fewer gallons of gasoline in California automobiles would need to be burned to achieve the 181 million metric ton carbon dioxide equivalent (181 MMTCO2e) specified-target reduction over the 12-year period from 2019 through 2030. Knowing that for every gallon of gasoline combusted releases into the atmosphere a minimum 19.64 pounds of carbon dioxide, in order for 181 MMTCO2e to be emitted, that would require the combusting of somewhere in the neighborhood of 16 billion gallons of gasoline over that timeframe which comes down to an average per-year ignition of 1.33 billion gallons. Going off of the premise that the average yearly fuel consumed per automobile is 600 gallons, it would take approximately 2.217 million motor vehicles over that duration of 1 year to go through that much gasoline. All of which means that over that dozen-year period, the state could meet its 2030 GHG emissions-reduction goal of 250 MMTCO2e by purging roughly 26.6 million internal-combustion-engine-powered automobiles from its roadways, meaning reductions from other GHG sources would be unnecessary and this would mean that such could remain flat. That being unlikely to happen, California emissions reduction must come in other ways. So, how does the state do that? Good question. Our buildings – meaning residences, places of work, the venues we go to, to recreate, to get an education, to eat and so on and so forth must become greener. More broadly, cities need to become greener as well. That’s the bottom line. “… I’ve read where years ago a critical decision was made to not only densify but, transit was substituted for highways. This truly insightful decision resulted in Vancouver being transformed, evolving from what once could be described as having a ‘cookie cutter’ urban framework or appearance, in effect, following a growth and development style so common in so many other cities across the North American continent, to what can be considered a model with respect to place-making, space utilization, and enhanced travel and transportation efficiencies. A new and improved Vancouver had arrived! “That this is the case, why more and more cities are not following Vancouver’s lead is at best, puzzling and at worst, troubling. And, that has implications in the Golden State for California cities. In all of my 65 years, I have only seen a transit-oriented community once. And, the TOC (transit-oriented community) of which I’m referring wasn’t even in California; it was in America’s largest state in the continental U.S. for land area – Texas. 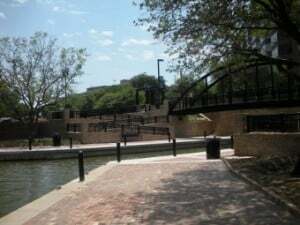 The place of note is known as Las Colinas, is situated inside the community of Irving in the greater Dallas area and I ventured there in May 2012. After having a bit of a time locating Las Colinas, before I finally and eventually did, I had little idea of what to expect if only because this would be the first of my TOC visits. The town’s main thoroughfare (Los Colinas Boulevard) was like most; street-centered parallel-parked vehicles, cars and buses making their way past multistory buildings with what I remember housing upper-floor residential with ground-floor office, retail and restaurant space. For me, at least, the main focal points were two or maybe two-and-a-half to be a bit more precise; a town lake and tributary or canal system and not one, but two, community-served fixed-guideway transit systems: The Las Colinas Area Personal Transit System (APT) and DART, the Dallas Area Rapid Transit light rail line. Whereas the APT is an intra-community, elevated service, the DART system serves much of the Dallas region. The main street commercial was fronted by wide sidewalks while the buildings themselves were dressed in tones that are easy on the eyes. Filling out the community, meanwhile, are hotels, high-rises, a community park, fire station and post office and an edifice for maintaining the APT. For all intents and purposes, Las Colinas is a city contained within a larger city. With more development no doubt planned (there is space for such), Las Colinas is a community growing “up” around transit. Now, imagine in the future if such is the way California developed and grew. Smart growth, transit-oriented communities becoming a dime-a-dozen, par for the course instead of the “sprawl-for-all,” if you will, paradigm that seems to have become a Golden State fixture – a fixture that has been part of the state’s landscape for close to 100 years if not more. In these types of living situations, the compact, self-contained living centers, that is, the ones that like Las Colinas are pretty much self-sufficient at the same time, compared to those homes located in suburbia, have smaller carbon footprints, so typical of transit-oriented, mixed-use, denser, more compact communities which usually promotes less driving, more walking and biking, increased transit usage (where available) for those who, from time to time, venture outside TOC or TOD (transit-oriented development) villages for work, shopping, recreating and what-not. The difference can be profound. While I’m not saying TOC, TOD should supplant all other types of residential development patterns, what I am, however, getting at is that brought about should be balance in living arrangement. And, just because for many sprawled suburban or exurban living has become a way of life, this does not mean such has to go on in perpetuity. Variety, after all, is the spice of life, you know. Now this same ideal can transcend living to practically any and every aspect of life. The same is true with regard to energy generation, farming, industrial, manufacturing and commercial activity, you name it. I watched with interest a local television production that highlighted a grape-growing enterprise that incorporated sustainable farming practices into operations. I was particularly impressed with the organic nature with which the grapes were grown and, if I recall correctly, how pests were managed also – with non-toxic means of control. It was impressed upon viewers and listeners that, at the end of the day, the practices employed provide more value than with conventional growing in this instance due to there being less damage to the environment. And, it was either in that program or another (I can’t remember for certain) that like growers who do things the so-called “old-fashioned” way were hesitant to take that leap of faith and make the switch if for no other reason than because the traditional method of farming for them is the way things have been done for generations and that’s what these farmers knew and what they felt comfortable with. For those growers that made the transition, it no doubt for them meant going outside of their comfort zones and taking a risk. In hindsight, as they look back, they’re glad they made the switch. California can do this. It’ll be a challenge, but it can be done. “Hitting 2030 GHG-mark harder with California driving-miles rising – 1” can be accessed here. This post was last revised on Dec. 4, 2018 @ 8:24 p.m. Pacific Standard Time. …and I read that our November, 2018 wildfires generate more GHGs than all of California’s 2018 vehicle operations. Wow….how do we stop that?